A6, A5 and A4 note pads printed with information about you - eg email addresses, telephone numbers, addresses and product range - are amongst the most effective way of promoting a company or its products. They are easy for you to distribute and clients love and use them! 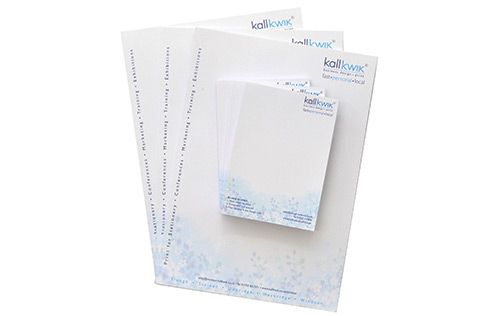 Kall Kwik has been designing, printing and handing out memo or note pads for over 25 years so we do have faith! FAST – We generally design in 1-2 days and, depending on quantity, produce the final pads in 2-3 days also. LOCAL –We can visit your office – at short notice – to discuss your requirements. Free local delivery is part of our service - or you can collect from our centre in Clarence Street. We have a car park for customers’ use behind the centre.